On Sunday, 27th March, Islamic Study Center (Charlottesville, VA) is hosting its program on the series Five More Sundays which features five themes: Peace, Justice, Mercy, Love and Freedom, each being adress on Sunday every month. Tomorrow, is the 4th in the series on the Subject of LOVE and to provide Sufic perspective, contemporary Sufi Guides Shaykh A. Nooruddeen Durkee and Shaykh Ahmed Abdur-Rashid will give valuable discourses. The event is scheduled to begin Inshallah on local time (Eastern Day Light Saving Time) at 10:30 and finishes at 5:00 pm. The talk by Shaykh A. Nooruddeen Durkee begins at 11:15 am. 09:15 pm - 10:30 pm, Dhaka local time. You may compare your local timing from WorldTime site. and He is the Ever-Forgiving, the All-Loving, Lord of the Glorious Throne. Heart of the faithful is Abode of the Lord. In this discourse, Shaykh Nooruddeen Durkee take the audience in an journey into various stages of True Love from Sufic perspective. Click this link to join in via Live Webcast on Sunday at the time mentioned in the beginning of the post. 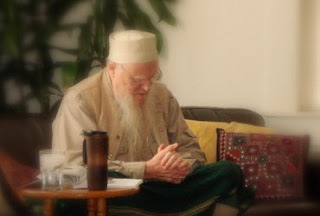 Shaykh A. Nooruddeen Durkee, the Khalifah in North America of Shaykh Dr. Ibrahim Muhammad al-Battawi, from whom he received idhn and ijaza in 1984CE/1405H to teach Islam from the Sufic perspective and to initiate, train and guide people specifically in the way of Shaykh Abu'l Hasan ash-Shadhdhuli, may Allah sanctify his secret. The Green Mountain School is actively dedicated to making known in English language and Arabic transliteration the ahzab, adhkar, awrad and du'aa' of Sidi Abu'l Hasan ash-Shadhdhuli, the epitome founder of Shadhdhuili Sufi Path.